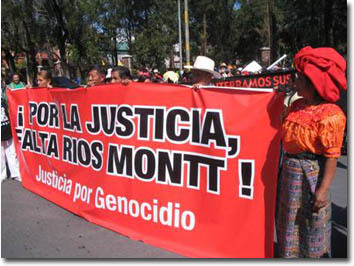 The investigative phase of the international human rights case charging three Guatemalan former military presidents and five senior army and police officials with genocide, state terrorism, torture and other crimes against humanity opened a second round of hearings on May 26, 2008, in Madrid, Spain. Judge Santiago Pedraz presided in his chambers at the Audiencia Nacional (Spain’s federal court) as five survivors and four expert witnesses described the scorched earth operations that decimated hundreds of Mayan communities in the department of Quiché in Guatemala’s highlands during the early 1980s, as well as issues relating to ethnicity and racism that have bearing on the case. Almudena Bernabeu, the Center for Justice and Accountability’s lead attorney for the plaintiffs, questioned witnesses. Four of the survivors who testified were members of the National Coordination of Widows of Guatemala, (Coordinadora Nacional de Viudas de Guatemala—CONAVIGUA), a women’s organization that campaigns to establish the fate of "disappeared" relatives, promote education and support people displaced as a consequence of the internal armed conflict. Since the organization was formed almost a decade ago, its members have been the target of repeated death threats, intimidation and physical attacks. The fifth witness, Domingo L., was a member of the Committee of Campesino Unity (Comité de Unidad Campesina—CUC), established in 1978 as the country’s first peasant organization to include both Indians and Ladinos as members. The CUC works on behalf of Guatemalan campesinos on issues such as labor, wages, land ownership, violence and the environment. 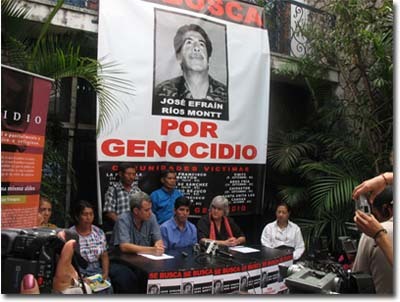 In addition to the Maya Quiché survivors, four expert witnesses were asked by Bernabeu to give testimony on their research: anthropologists Ricardo Falla and Beatriz Manz, who have both written about massacres and displacement in the Quiché during the period in question; anthropologist Charles Hale, who has studied Ladino attitudes about ethnicity in Guatemala in general and the department of Chimaltenango in particular; and political scientist Marta Casaús Arzu, who has conducted extensive studies on racism in Guatemala. Also present were Benito Morales of Fundación Menchu; Juan Francisco Soto of Centro de Acción Legal por los Derechos Humanos; Naomi Roht-Arriaza, University of California, Hastings; Susan Kemp of Impunity Watch in the Netherlands; and Kate Doyle, National Security Archive. For additional background on the case, click here.